As a child that grew up in the '80's I remember being served moussaka and not liking it. This dish was a request from my daughter after we tried and loved melanzane alla parmigiana earlier in the year...it was delicious and the perfect end to my 'One Year 52 Recipes' project. Layer the slices of aubergine in a colander and sprinkle with sea salt between each layer. Leave for an hour. Fry onion until soft, add and fry off the lamb until brown. Add garlic, cinnamon, oregano and tinned tomatoes. Simmer for half an hour, then leave to cool. Pat the aubergine slices dry with kitchen towel. Fry the slices on a skillet until crisp and golden on both sides. 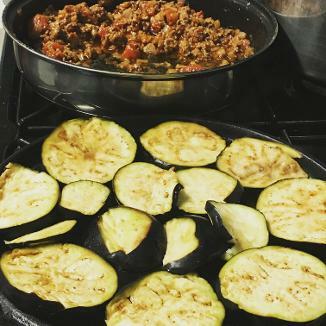 Make a layer of slightly overlapping aubergine slices over the base of a square or oblong casserole dish. Top with a layer of half of the lamb. Add another layer of aubergines, then lamb. When ready to cook, preheat oven to gas mark 4. Bring the milk to just below boiling point. Melt butter in a separate pan, stir in the flour and cook it for a minute. Remove from the heat and whisk in the milk little by little to make a smooth sauce. Return to the heat, warm through gently and add the cheese, stirring until melted. Take off the heat, allow to cool slightly and beat in the egg. Stir in cinnamon. Pour the sauce over the layered aubergines and lamb. Bake in the oven for 45-60 minutes until well browned. Cover with foil, leave to rest for around 15-30 minutes, then serve. As an alternative, replace the lamb with 500g minced beef and 300g chopped salami such as Ham and Cheese's Toscano. Add an additional tin of tomatoes, prepare 1-2 extra aubergines and double your béchamel sauce.